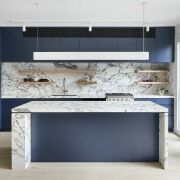 ​​​​​​​Rooms were merged and French doors with matching screen doors introduced, looking out to a courtyard garden to set the scene for this marble and blue kitchen by McMahon and Nerlich. 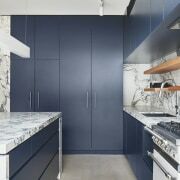 Sometimes a few strategic architectural moves can set the tone for a kitchen design even before the first cabinetry piece has been designed. Such was the case here, where architect Rob Nerlich of McMahon and Nerlich merged two existing spaces and added three sets of French doors. 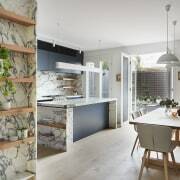 “The owners were renovating and wanting a relaxed setting to reflect their love of fine art, cooking and reading, as well as entertaining for their extended family,” says Nerlich. 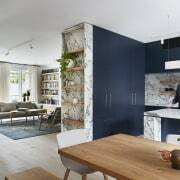 “We proposed opening up the two ground floor spaces to each other and reorganising the facade to introduce three French style doors, which better linked the landscaped courtyard to the kitchen. 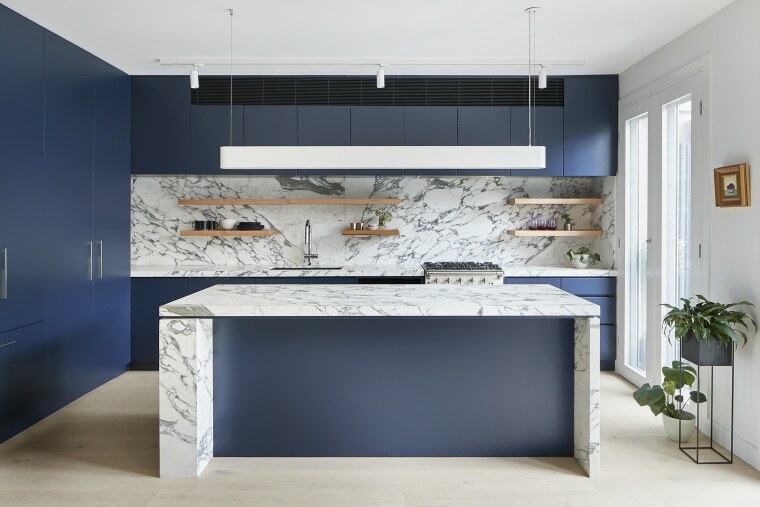 Nestled into this spacious, light-filled area, the two-tone kitchen is a restful mix of natural marble and blue cabinetry faces. 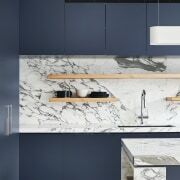 ​​​​​​​The clean, crisp island with its waterfall benchtop is the centrepiece of this kitchen. Free from sinks or other functional elements, it offers a large prep area for the owners to use while they chat with family or visitors. The design and placement of the cabinetry and appliances helps build the serene aesthetic, as well as adding a wealth of functionality. 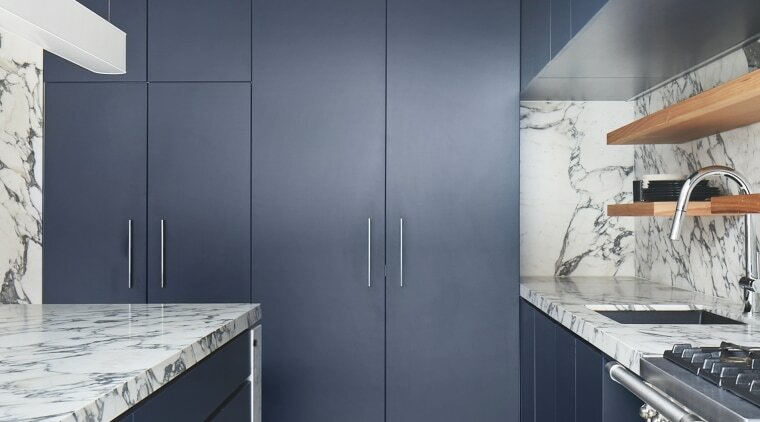 ​​​​​​​In this kitchen, by McMahon and Nerlich, the end cabinetry houses the fridge and a tall pantry. The Lacanche range adds a country accent to the design. Beneath the frameless, flush rangehood, the Lacanche cast-iron range is proudly on show, bringing a touch of country charm to the kitchen and complementing the French doors. Storage is addressed by the pantry, drawers on the business side of the island, the perimeter cabinetry and the open display shelving. And the kitchen is just as elegant behind the scenes. 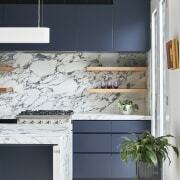 The tall pantry doors open to reveal marble-lined interiors lit with sensor lights. Free of services, the island is the central focus, providing a generous preparation area and space for relaxed gatherings. 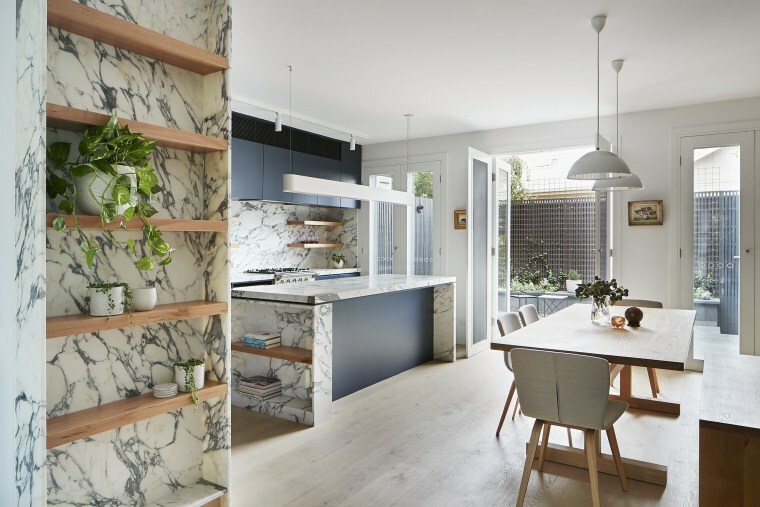 Melding with the living, dining and courtyard spaces, the kitchen completes the informal living zone.